ENROLL NOW FOR THE SPRING SEMESTER! KID ACTION reflects the high energy, fast-paced movement that kids experience all around them everyday. Kid Action is based on Elizabeth Streb’s POPACTION which intertwines dance, athletics, boxing, rodeo, the circus and Hollywood stuntwork into bristling muscle-and-motion vocabulary! STREB’s work is of particular interest to young people who are continually testing the limits of their physical universe. Based on the principles of POPACTION, young action engineers will be intrigued by the vigorous exploration of impact, velocity and the defiance of gravity through a combination of physical conditioning, daredevil stunts, acrobatics and aerial arts. KID FLY invites kids ages five and up to come develop their Flying Trapeze skills. All participants are evaluated individually and are taught at their own pace by our trained instructors. For more experienced flyers, the ESPANA-STREB TRAPEZE ACADEMY allows students to work more intensively on specific tricks to master the ones they know, and learn the ones they dream of doing! Our team of instructors can help them achieve class goals by giving them tips and techniques to improve their form and personal style. The instructors have varied backgrounds but all are focused on safety and ensuring the students have a great experience. KID POPACTION reflects the high energy, fast-paced movement that kids experience all around them everyday. 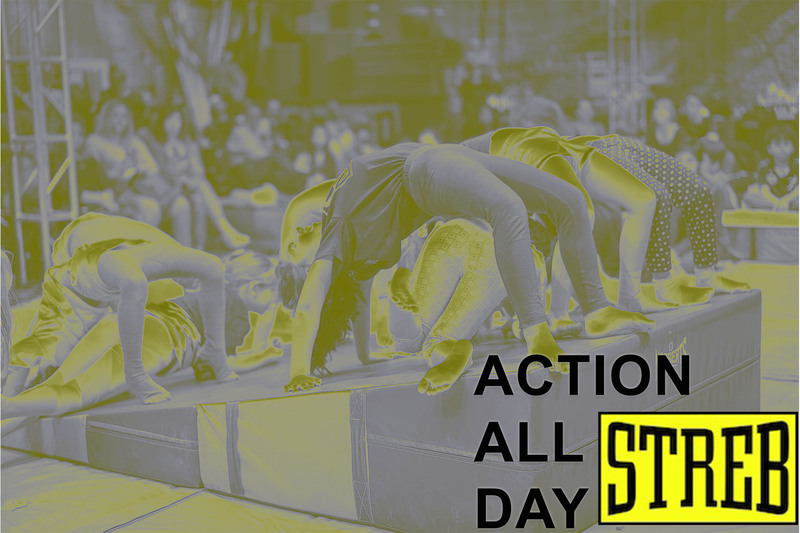 Kid Action is based on Elizabeth Streb’s POPACTION which intertwines dance, athletics, boxing, rodeo, the circus and Hollywood stuntwork into bristling muscle-and-motion vocabulary! STREB’s work is of particular interest to young people who are continually testing the limits of their physical universe. Based on the principles of POPACTION, young action engineers will be intrigued by the vigorous exploration of impact, velocity and the defiance of gravity through a combination of physical conditioning, daredevil stunts, acrobatics and aerial arts. *Please note that Baby POPACTION is a “guardian and me” style class and requires a guardian to participate in the class with the child. *NEW! FLYING FAMILIES A new offering at SLAM, and the only flying trapeze class of its kind in New York! This class is designed for families to fly, learn, and play together and with other families in the Espana Streb Trapeze Academy community. Child and adult arrive together for class; warm up with our experienced and skilled instructors; and progress through different tricks and skills — honoring STREB’s personal best philosophy. Once tricks are learned, students will attempt a catch with one of the ESTA instructors! Whether you’ve never flown before, or you are working on your triple backflip, our coaches offer the complete spectrum of coaching for all skill levels. Multiple adults can sign up with one child, or multiple children with one adult. The more the merrier! TRAMPOLINE provides your kids with a place other than your furniture to bounce, flip, and twist! Available to kids from ages 5 and up, it introduces the fundamentals of trampolining with a twist of the Pop Action technique. Students will build acrobatic skill, sharpen body awareness, and learn the proper and safe techniques of partnering on a trampoline. Alternatively, mail a check made payable to STREB, Inc. to the address above along with your registration form, after calling (718) 384-6491 to secure availability. ALL SPRING 2019 KID REGISTRATION (deposit, balance, or payment in full) paid for using a credit or debit card will be assessed a one time per semester, $25 processing fee, per child. Please contact us at info@streb.org or by phone (718) 384-6491 to find out how to avoid this fee! 1. Students are encouraged to arrive early so that classes may start on time, but please keep your children off of the equipment until the time of their class. 2. Parents are responsible for their children before and after class time. Please clean up one’s belongings after class and return folding chairs to the chair rack. 3. We allow food in our space, but please help keep SLAM beautiful by placing all trash and food items in the proper receptacles. Food is not allowed on the mats or in class at any time. 4. Please dress your child in comfortable clothing. 1. Make-up classes (up to 3 per semester) could be arranged in cases of illness/injury. 3. All make-ups must be scheduled during the semester in which the original class was missed. 4. Make-ups cannot be transferred to other students. We offer two one-time drop-in sessions per student, per type of class, each semester. A drop-in session for an ACTION class is $30 and a drop-in session for a FLY, trampoline or babyaction class is $35. Full tuition or a deposit of $150 is required to hold your child’s place. The remaining balance is due on the first day of class. 10% discount on two or more classes per family. Discount applied on additional classes of equal or lesser tuition. Private classes available in all disciplines. For information and to book call 718/384-6491. Class times and availability are subject to change. For more information about classes, contact info@streb.org or call (718) 384-6491. Anniversary Day, Thursday, June 6 – NO KID CLASSESNote: STREB Kids Classes closures follow the NY Public School system in cases of emergency. Please call ahead in cases of weather or other city-wide emergencies. The public schools are closed and our regular kid classes are not running, but we have created a full day filled with ACTION to give your kids something fun to do on their day off! Activities include POPACTION, TRAMPOLINE, FLYING TRAPEZE, AND PARKOUR along with all of the flying, falling, and crashing you can imagine! *Please note: payment must be made in full in order to reserve a spot. NO DEPOSITS. No credit card processing fees. Call (718) 384-6491 or email info@streb.org to register!